President Mustafa Akıncı received the UN Secretary General’s Special Adviser on Cyprus Espen Barth Eide yesterday. The UN Secretary-General`s Special Representative Elizabeth Spehar accompanied Eide, who also met with Greek Cypriot Leader Nikos Anastasiades following the meeting with Akıncı. Following the two hour meeting with Akıncı at the Presidency, Eide held a session to respond to journalists’ questions. Eide stated that they worked on preparing for the summit and the Cyprus conference which will be held in Geneva in January, 2017. He also noted that at yesterday’s meetings the two leaders laid the groundwork for their bilateral meeting today. Eide pointed out that there are only 19 days left until the Geneva meeting, and welcomed the intensive work being done by both sides ahead of this. The martyrs who lost their lives in the struggle for existence are being commemorated with a number of ceremonies to mark the 21-25 December Struggle and Martyrs Week. 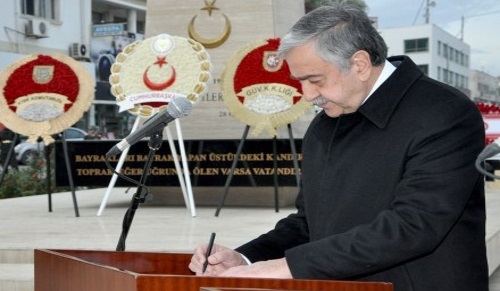 The first ceremony to mark the occasion was held in front of Lefkoşa Martyrs Monument. This entry was posted in News and tagged 25 December Struggle and Martyrs Week, 5-party Conference Geneva, Cyprus negotiations, Elizabeth Spehar, Espen Barth Eide, Mustafa Akıncı, Nikos Anastasiades, North Cyprus, TRNC. Bookmark the permalink.